This is a knitting pattern for a hat. This pattern is for any weight yarn! Work at any gauge (no swatch necessary) to make a custom fit hat by working the modular sideways brim first. 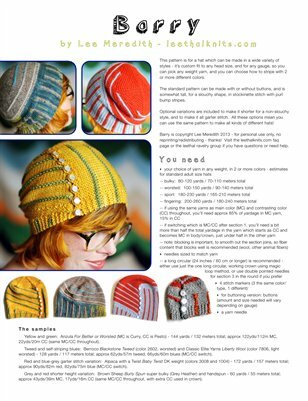 This pattern is for a hat which can be made in a wide variety of styles - it’s custom fit to any head size, and for any gauge, so you can pick any weight yarn, and you can choose how to stripe with 2 or more different colors. The standard pattern can be made with or without buttons, and is somewhat tall, for a slouchy shape, in stockinette stitch with purl bump stripes. Optional variations are included to make it shorter for a non-slouchy style, and to make it all garter stitch if you prefer. See the Barry page on leethalknits.com or on ravelry.com for photos and more details about the pattern.